On the "Science of Nunology" Radio! 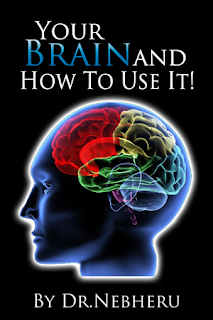 "HOW TO EAT FOR YOUR BRAIN!" Click the link below to listen now! A Nunologist Guide to: "Mental Associative Patterns!" Do you know that we create the meaning to everything we experience in life; it's called "Associative Patterns". We decide whether an experience is Positive, Negative or Neutral. Many People believe or "feel" that the meaning they give to their life experiences is real. The truth is that we choose how we interpret whatever we experience in life. Your interpretation of life events is based on your past experiences, beliefs, upbringings and the emotions we attach to them. Question: What is Associative Patterns? Answer: Associative Patterns are how we log or file things in our mind, we as Humans link experiences with People, Places and Things with our Emotional feelings of them. For instance you may have tasted a Tea you really enjoyed and said, "Wow, I really LOVE that TEA", or you may have Smelled a Perfume and said "Oh no that Stinks!" Well in your mind you have filed these things away in a pattern in your mind and this pattern is formed in the deeper levels of your "Subconscious Being" and then over time forms your Habits, which over times forms your Character, and way of life thus, your Destiny! Now you wonder why People are so negative, when living in a society that "GLAMORIZES" NEGATIVTY! Everywhere you turn around you are taught to "WORSHIP DEATH", the News you watch keeps reporting Killings and Death, the Movies show "DEATH" killing, murders, etc... the Music teaches you how to be Negative, names like "NASTY GURL", "FREAK MAMA" or even I am a "THUG, KILLER" etc... to be "BAD, NEGATIVE is cool, hip and the way to be in AMERICA", then you wonder why it is hard to get these negative patterns, and THOUGHTS out of your MIND. You are constantly and we mean Constantly being Subliminally, programmed, taught and reinforced over and over again about HOW BAD THINGS ARE! When you tell a person that they look sick, long enough eventually the person will get sicker! Question: So what must we do, I mean I feel "POWERLESS", I mean what can I do? Answer: Well, you can start by Channing the Meaning, reprogramming your "Associative Patterns" logged deep down in your Subconscious Minds. You begin to change this by first re-defining your "belief or Emotional System", learning to accept you as you, start there! Then realize that you are in control of yourself and whatever challenges you are going through, you do not have to go through this at all, reclaim yourself today, and EMPOWER yourself right now TAKE BACK YOUR EMOTIONAL ENERGY! Knowing you are in control of your emotions is the first steps into controlling your future. Start realizing that "it's all a creation of your MIND", for "MIND POWER" is all there is in the Universe (Multi-verse). Know that you actually have the power to choose what feelings or "emotions" you attach to each situation, you experience in your life. When you are not feeling good about something occurring in your life stop, pause and reflect on what interpretation you have given to these events. Remember it is your Emotional Energy and attachment to them that brings it to life, "For energy flows where attention goes." For Instance, if you where were just "LAID OFF" from your Job, and you are really upset and mad as you know what, first calm down, stop , pause then ask yourself "Why am I feeling this way?" Your answer may be "because I can't believe my employer fired me! I worked so hard for 1 year, 2 years or even 10 years etc... for them and this is how they treat me! They don't appreciate me! They never appreciated me! Now listen and think in this scenario you have made losing your job "mean" that your employer doesn't care about you and that you are not "appreciated" by them. Now your interpretation of this situation can come from many different realms. It could be that in the past you where ignored by family members and were told you would amount to nothing; this could be the reason you have: "Interpret" the situation in this specific way. On the other hand if you had a very loving and caring family environment growing up and were always told how wonderful you are, you could "react" to this situation differently. You might just say "OH WELL" and brush it off and say "What can I do, it is what it is!" And even see this as an opportunity to find the kind of work you really love! So it's our Meaning or Emotional attachments and how we define them in life that mean so much to whether we have success or failure! Energy is everything and Emotions are "ENERGY IN MOTION"! Learn to see the Bright side of the coin in life at all times and you will only "ATTRACT" to you that which you see, GLITTER and GOLD! DR. NEB HERU (NUNOLOGY™): IS YOUR HEART IN THE RIGHT PLACE? 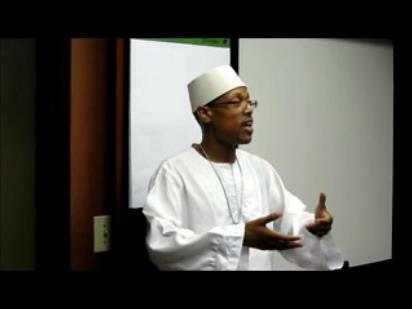 Listen to this all new Lecture by Supreme Nunologist Dr.Neb Heru as he teaches on the 9 (Nine) Dimensions of Self and much much more! 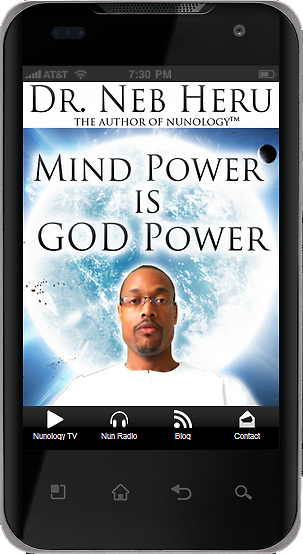 SUPREME NUNOLOGIST DR.NEB HERU RELEASES HIS OWN APP ON GOOGLE PLAY ANDROID MARKET! Is he the 1st to do it? 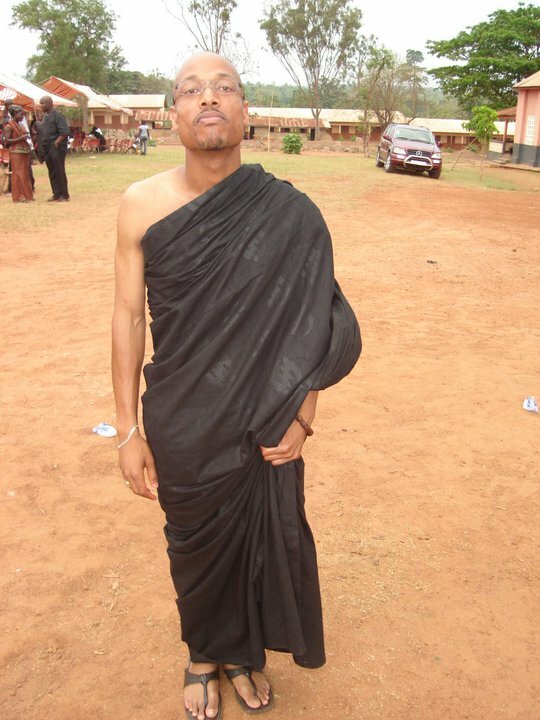 Wow it’s been a lil over 2 years since Dr. Neb Heru returned from Ghana, West Africa with a Science he has been inspired to teach and Bring to the World he effectionaly calls Nunology. 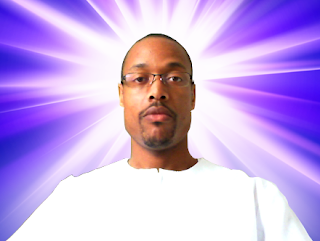 Since his return Dr. Neb Heru has written 16 Books to date all dealing with “Thinking Poisitive”, “Eating Right”, “Emotional Control”, “Subconscious Reprogramming” and Mastering Ones Destiny! Dr. Neb Heru has already been published on all Online Major Books Stores like Amazon.com, itunes, lulu.com and Barnes&Noble! Well Dr. Neb Heru has done just that! DR. NEB HERU (NUNOLOGY™): THE VOICE WITHIN! FEATURED BOOK OF THE WEEK! *please note free shipping applies when you order directly from our website. 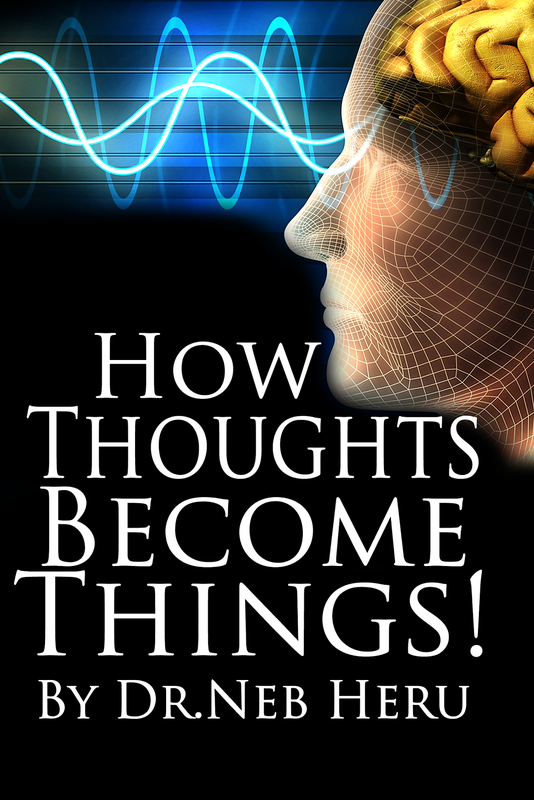 Did you know that your thoughts effect the outcome of your Life? Did you know that there are Cosmic Forces within Nature waiting and ready to assist you accomplish all your Goals, Dreams, Wishes and desires... all we have to do is learn how to call on them? Did you know that Mind Power is the Greatest Power of all and travels faster then the Speed of Light? Did you know that what you are attracting into your Life solely depends on the images you are holding in your Mind's Eye? Well now within this Nun Tablet (Book) "How Thougts Become Things" you will be re-introduced our Ancient Egyptian, Ancient African Way of Manifestation called "MENTAL MAGIC" know in this day and time as NUNOLOGY! NOW IS THE TIME to Become the Master of Your Own Destiny!